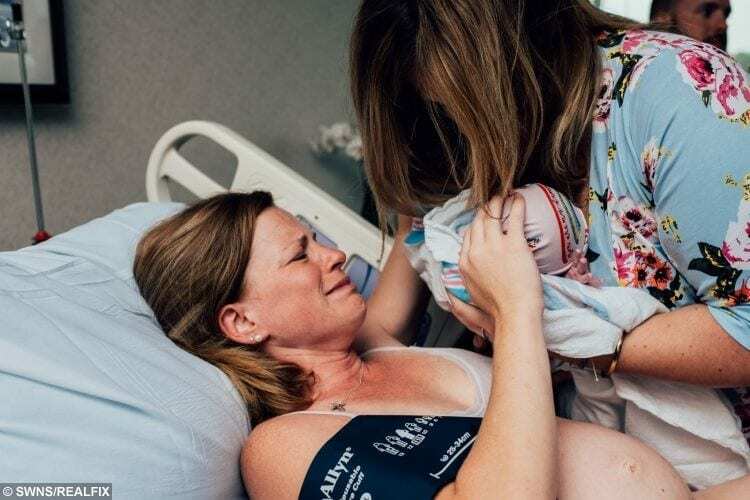 This is the emotional moment a woman who suffered six miscarriages burst into tears after her best friend surrogate gave birth to her baby. Erin Boelhower, 33, endured nine IVF transfers and more than 600 injections over the course of three years trying to get pregnant with husband Matthew, 33. Matthew and Erin Boelhower holding baby Scottie. 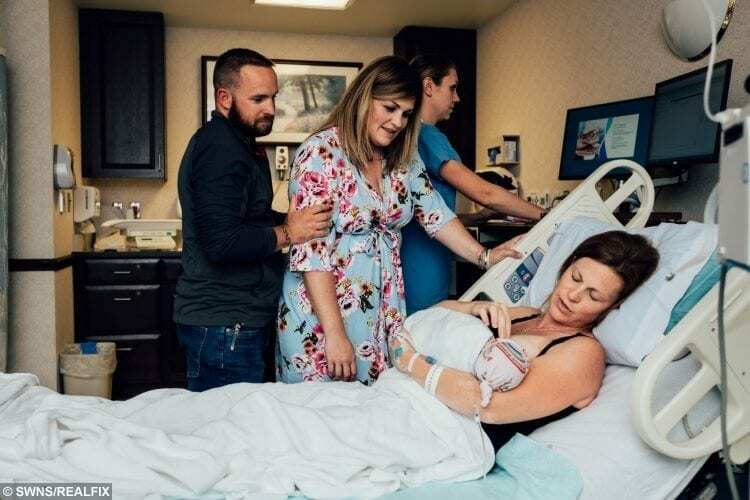 Their dream finally became a reality when Erin’s best friend Rachel Checolinski, 34, gave her the gift of a lifetime and offered to be her surrogate. Two of Erin’s embryos were transferred to Rachel’s uterus in January and she was confirmed pregnant later that month. 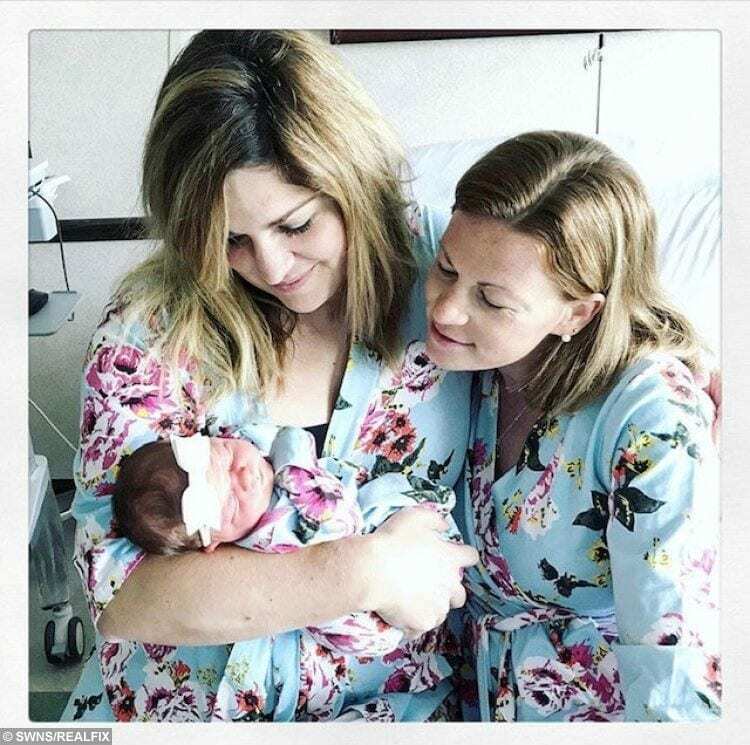 The pals spent the next nine months side-by-side and Erin was at the hospital with mom-of-three Rachel when she went into labor with baby Scottie on September 19. 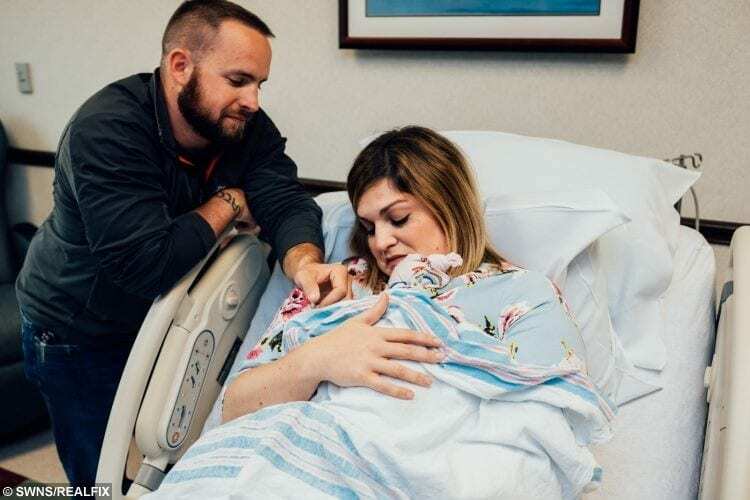 A precious photo shows Erin overwhelmed with emotion as she holds her newborn daughter for the first time, while husband Matthew bawls in the background. Rachel Checolinski holding baby Scottie with Erin Boelhower. Sales rep Erin, from Woodstock, Illinois, US, said: “I have no clue how I lived this long without Scottie. Rachel, 34, a full time mom from Fond Du Lac, Wisconsin, met Erin in 2008 when they worked at an airport together. As soon as Erin married her husband Matthew, a corrections officer and former marine, in October 2012 the couple began trying for children. Rachel Checolinski holding baby Scottie. After a year with no positive pregnancy test, Erin discovered that her left fallopian tube was infected and needed to be removed, making it very difficult for her to conceive naturally. After surgery, she was diagnosed with polycystic ovarian syndrome (PCOS) and hypothyroidism. The couple then began intrauterine insemination (IUI), a fertility treatment where sperm is placed inside a woman’s uterus. Erin said: “This would be the beginning of our hundreds of injections. “I was terrified of needles. When we first started these treatments, I would go to Matt’s work every night for him to inject me with the hormones – that’s how scared of injections I was. Erin Matthew and Rachel while pregnant. In November 2014 Erin and Matt began their first cycle of IVF. At Thanksgiving that year, Erin discovered she was pregnant for the first time. She learnt that she had miscarried the baby on her 30th birthday, during her six-week scan. She said: “It’s heartbreaking. You do IVF and then it works. But you never think a miscarriage will happen to you. Erin’s best friend Rachel, mom of Amarach, 13, Cillian, five, and Teagan, three, was beside her every step of the way. After Erin’s fourth miscarriage, Rachel offered her the gift of a lifetime: she wanted to be her surrogate. Erin said: “I wrote on Instagram about how I was reaching my breaking point and she sent me a message. 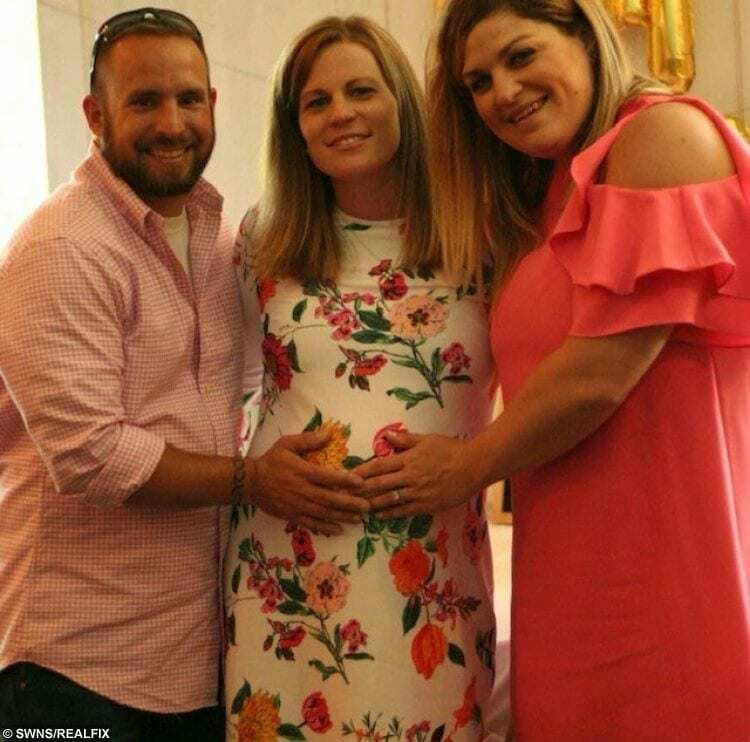 Rachel’s own difficulties conceiving her second child with husband Dan, 34, a pilot, had convinced her that she should be a surrogate for Erin. She said: “I struggled for two years to conceive Cillian so I knew the pain of wanting something really badly and not being able to fulfil that dream. “I had been there through all of Erin’s infertility treatments, I cried with her when she lost each one of her babies. Erin and Rachel with Scottie. 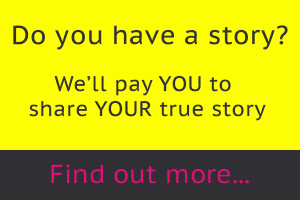 It was only when Erin suffered her sixth miscarriage in June 2017 that she accepted Rachel’s offer. 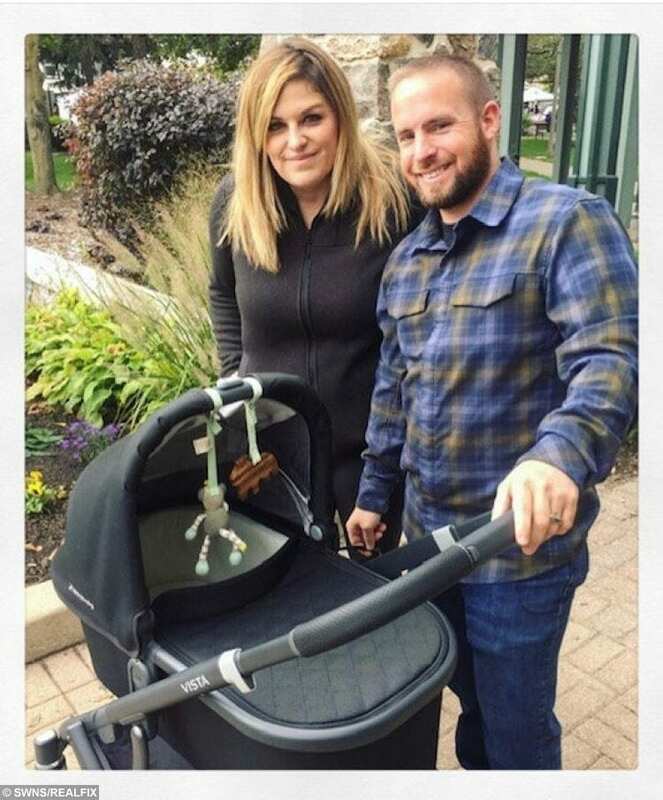 Erin and Matthew raised $40,000 to cover the costs of the surrogacy agency, fertility clinic, legal fees and Rachel’s medical bills. In January 2018, Rachel took a pregnancy test and discovered she was pregnant with Erin’s baby. Rachel said: “I knew I was carrying and having a baby that wasn’t mine. On September 19, Rachel gave birth to Scottie, who weighed six pounds eight ounces, at Aurora Health Centre in Oshkosh, Wisconsin, US. Erin said: “What made it even more special was that Scottie was born on my late father Scott’s birthday. He passed away from stomach cancer in 2015. “It was very hard for me to watch Rachel screaming in pain during the labour and knowing it was all for me. “Rachel is one of Scottie’s godmothers. She is pumping for Scottie now so that she grows up on breast milk.